If you are looking out for an affordable and compact printer with its primary specifications being printing, scanning and copying, HP Deskjet 2130 multifunction inkjet may be the right choice for you. The portable printer is capable of producing fast and high-quality prints considering the expectations of a home office environment. The all-in-one is quite an easy device to handle with dimensions corresponding to 18.7 x 7.5 x 13.9 inches. The input tray is capable of holding 60 sheets while the output tray can hold up to 25 sheets. HP Deskjet 2130 All-in-One ink cartridges are available in a combination of one black cartridge and another tri-colour cartridge that make printing with photos, documents and envelopes an affordable task. The device supports a print speed of up to 20 ppm for draft mode and 16 ppm for colour mode. In addition, the printer offers USB port to print documents up to A4 size directly connecting to your PC. Owing to its cabled connectivity, it shows high compatibility with many versions of Windows and Mac. HP is offering its Deskjet 2130 All-in-One model at an economical price. The printing speed and quality both are up to par with the printers of the same range. The HP Deskjet 2130 All-in-One ink cartridges make printing even more cost-effective in the long-run. Hence, for the home-office users who need a multifunction device for low-volume use, this device can prove to be an ideal choice - considering printing through a wired network. How to identify which cartridge is creating the problem in the HP Deskjet 2130 All-in-One printer? If you receive a pop-up message displaying that one of the cartridges is having the problem, then do the following steps to detect which cartridge is creating the problem. 1. Remove the black HP Deskjet 2130 All-in-One Ink Cartridges. Then, close the cartridge access door. The tri-color cartridge has a problem if the Ink Alert light for the tri-color cartridge blinks. If the ink alert light does not blink, the tri-color cartridge does not have an issue. 2. Keep the black HP Deskjet 2130 All-in-One Ink Cartridge back to its carrier. Now, remove the tri-color cartridge. Close the cartridge access door. There is an issue with the black ink cartridges if the Ink Alert light for the black cartridge blinks. Else, there is no issue with the black HP Deskjet 2130 All-in-One Ink Cartridge. How to clear the print queue in HP Deskjet 2130 All-In-One Printer? Step 1: Open Devices and printer, depending upon the operating system. For Windows 8.1 and Windows 8: Click the upper-right corner of the screen to open the Charms bar. Click the Settings icon. & then open control panel. Select devices and printers and click to open. Windows 7: Click Devices and Printers in the window start menu. Windows Vista: Click start tab. Select the control panel and click the printer. Windows XP: From the start menu of Window, select control panel. Click Printers and Faxes. Step 2: Open printer queue by clicking the HP Deskjet 2130 All-In-One Printer twice. Step 3: In the Printer menu, click Purge Print Document or Cancel all documents and then click yes for confirmation. Step 4: If there are still documents present in the queue, then restart the computer and try printing again. Q. A major part of my work involves printing text documents for which I require more black ink than colour ones. 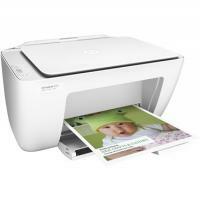 Should I buy HP Deskjet 2130 All-in-One ink cartridges for my HP Envy 4527 All-in-One printer? A. Yes, the black ink cartridges in the HP Deskjet 2130 All-in-One ink cartridges set actually print more number of papers (480) and colour cartridges print 330 pages. You can also buy a single HP Deskjet 2130 All-in-One ink cartridge when the black ink cartridge is about to get exhausted so you can print uninterruptedly. Q. Are HP Deskjet 2130 All-in-One ink cartridges affordable and offer better value for money than genuine cartridges? Q. How do I store partly used ink cartridges (I have HP Deskjet 2130 All-in-One ink cartridges)? A. Please make sure that ink cartridges, whether partly used or new that you won’t be using anytime soon are stored in a cool and ventilated place. They should be protected from high temperature (above average room temperature) as it can result in bubbling and foaming in the liquid ink. Further, when ink is heated up, its expansion and subsequent contraction when it cools can cause damage to the cartridge and you won’t be able to use it. Q. I am facing alignment issues in my HP Deskjet 2130 All-in-One printer and also need to change the ink cartridge in it. Is it necessary to load paper in the printer before beginning the process for replacing ink cartridges? A. Yes, you have to load some papers in the printer before replacing the ink cartridge and to start the alignment process. You need to take a print out after replacing the cartridge to see whether the printer is aligned properly or not.